Banana plugs make speaker installation a breeze - designed for use with amplifiers or speakers that use traditional binding posts. Not only is it easier to make the connection on the back of your amp, it is safer, with no chance of stray wire strands creating a short across contacts. 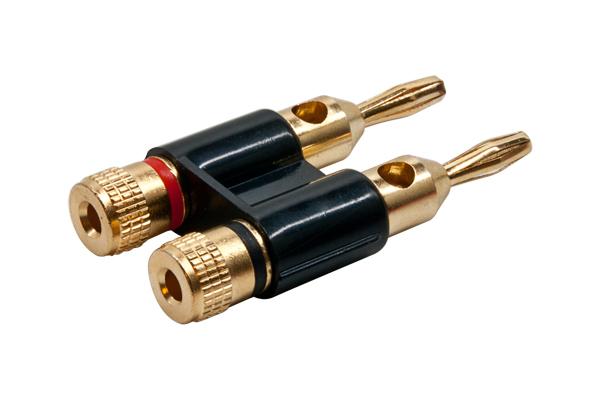 This high-quality dual plug has two banana plugs spaced 3/4"(18mm) center-to-center with a black plastic yoke, the typical distance between binding posts on speakers. The plugs are the open screw type and can accept bare wire, spades, or other banana plugs. 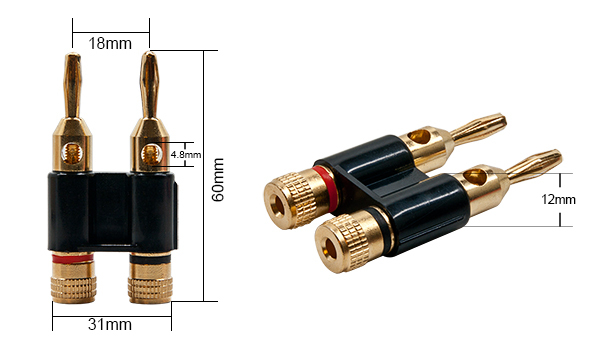 They are sized to fit speaker wire from 18 AWG (0,75mm²) to 10 AWG (6mm²). Each pair comes with one plug color coded red and the other coded black, for easy polarity identification.